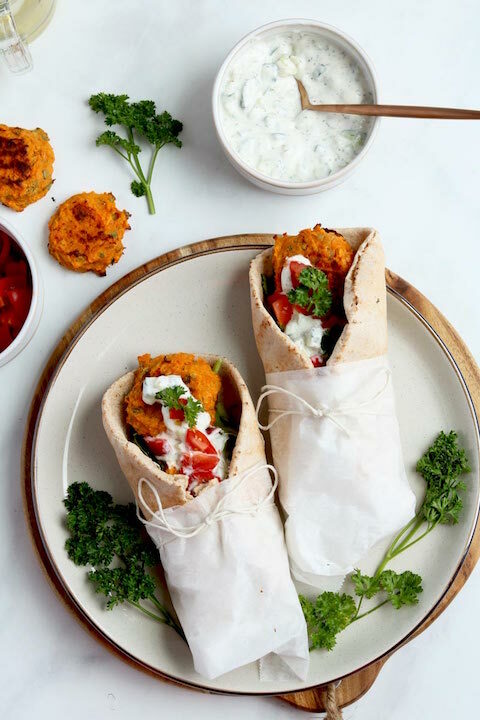 This recipe was submitted by Ashanne Cluff, Registered Holistic Nutritional Consultant located in Atlantic Canada. Don’t you guys think it’s time? Time to what, you say? 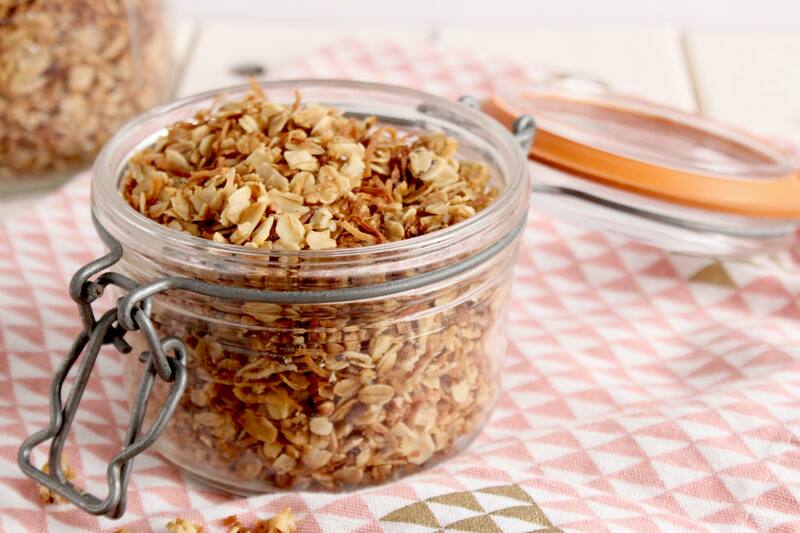 Well, it’s time to ditch the store-bought granola and make this Easy Toasted Coconut Granola, of course. Store bought granola is pretty darn easy: purchase, open bag, consume. 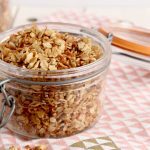 But, what if you added in, maybe 2 more simple steps (mix in a bowl and bake), we bet you would be pleasantly surprised just how delicious, cost-effective, and better for you, home made granola really can be! The reason why we suggest ditching the store-bought granola is that most store-bought granola is very high in processed sugar, and contains little fiber and protein- the exact opposite of what you should be grabbing for breakfast. Mind you, there are some great granola brands out there that have simple and healthier ingredients, take Bob’s Redmill, for example, but, they stil; yield quite a bit of sugar per serving. 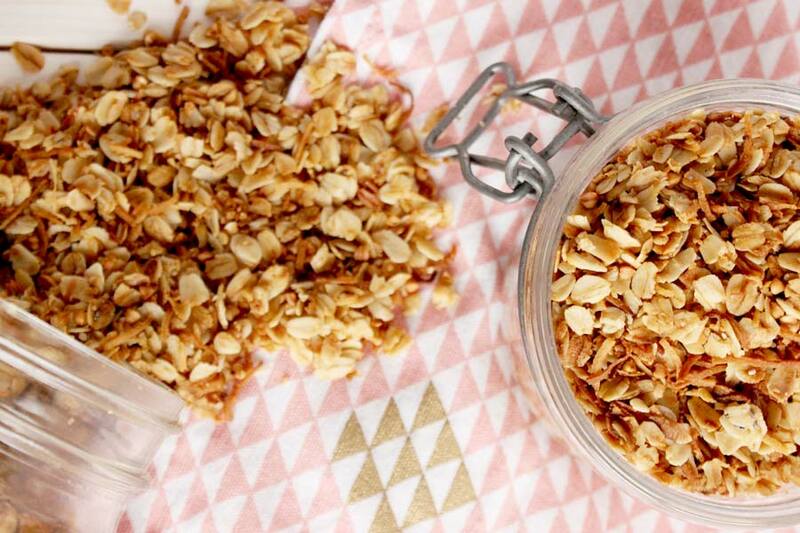 You’ll definitely get the benefits of the protein and fiber to balance your blood sugars, but we’re just here to tell you that THIS amazing granola recipe yields about 6 cups of granola (that’s granola for DAYYZZZ), and you get about 5g of added sugar per ½ cup of granola, the sugar content in this is pretty darn low, and unrefined sugar, to boot. 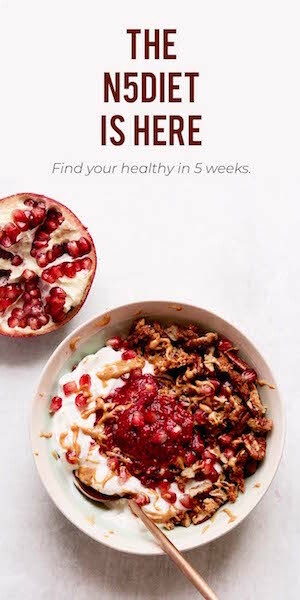 So, granola is bomb, parfaits are delicious, and that’s why we want to tell you more about the health benefits of it all. 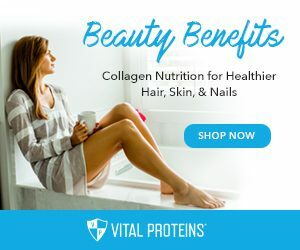 Oats are one of those wonderful superfoods (in our book anyway) because they are abundant in fiber and minerals, they are a whole grain (if you get the right kind), and contain all of your healthy macronutrients, making them a well balanced food. 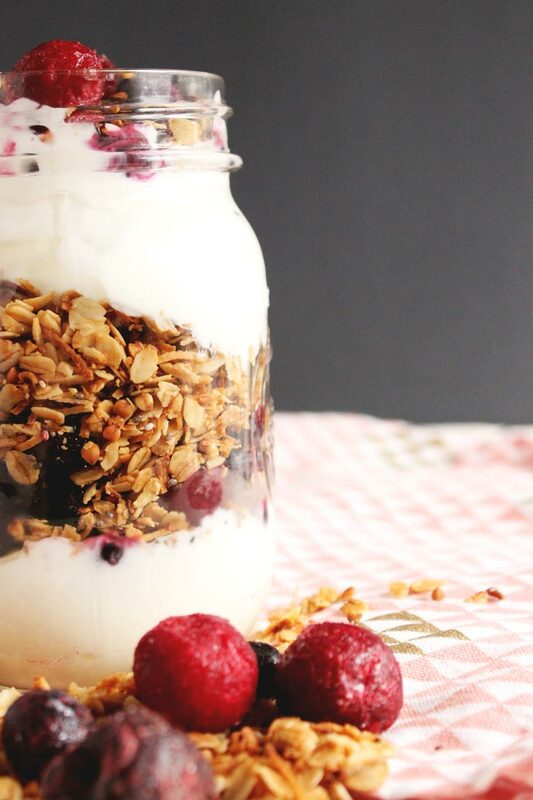 And making granola is hands-down one of the best ways to eat your oats. 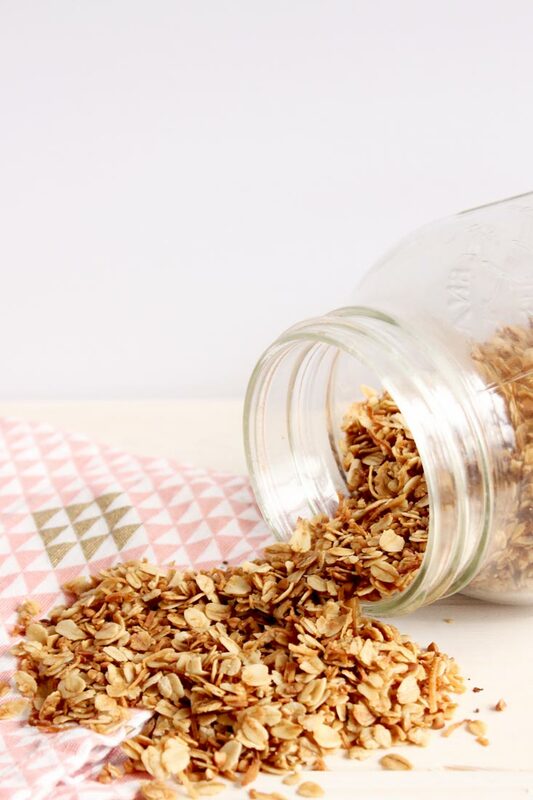 This granola is made with some pretty nutrient dense seeds, healthy fat coconut, cinnamon for flavour, yet it combines incredibly simple ingredients to make an incredibly simple granola. Top with: a drizzle of raw honey, hemp seeds, chopped almonds, cacao nibs etc. 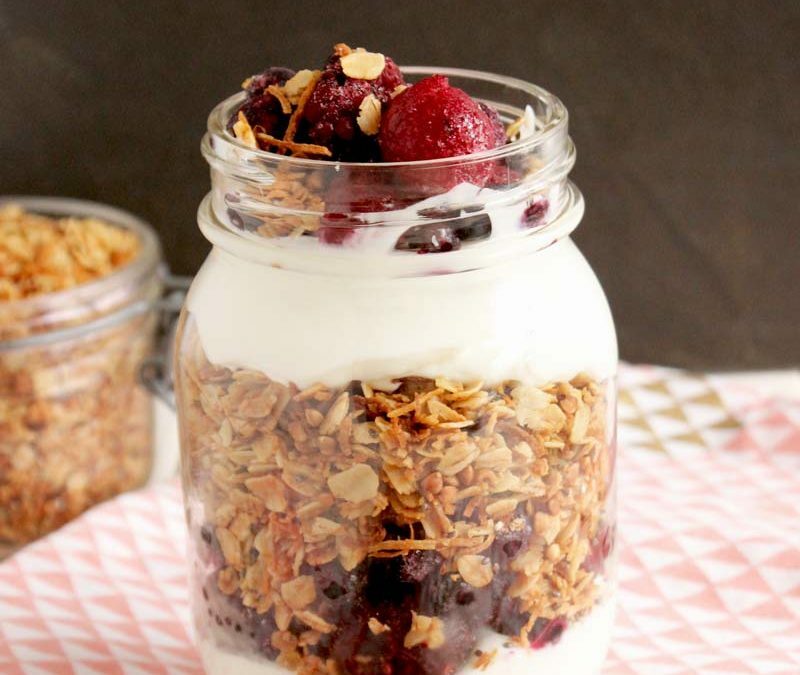 Get in on the granola recipe now. Make a big batch so you’re set for the month. In a large bowl combine dry ingredients and mix well. In a 1 cup measuring cup combine oil (melted if using coconut oil), sweetener and vanilla. Pour wet ingredients into bowl with dry ingredients and mix until fully coated. For cereal, spread out on one large baking sheet and bake at 325F for about 40 minutes, stirring occasionally. Make flax eggs by combining the ground flax/ chia with water and set aside for 5-10 minutes until gelatinous. Mix the rest of the ingredients into the flax/chia eggs. Line a 8x8 baking tray with parchment, and press the mixture firmly (to ensure they hold their shape) and bake until top is evenly deep golden brown. *For cereal I like to use extra virgin olive oil and maple syrup with chopped nuts added, where-as for bars I like to use virgin coconut oil with honey as the honey helps the bars hold together better. Chocolate chips are a great treat added into the bars! 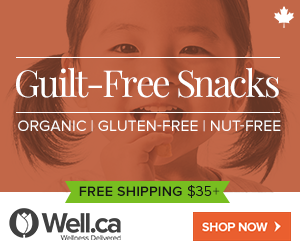 Ashanne is a Registered Holistic Nutritional Consultant TM located in Atlantic Canada. 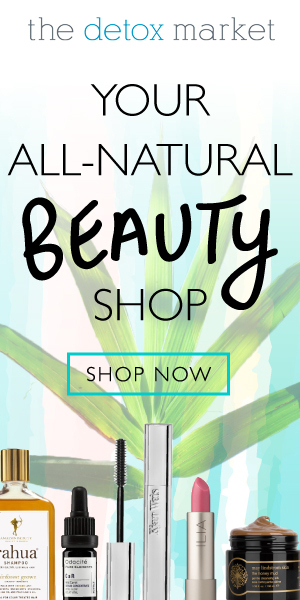 She has a passion for reconnecting people with the abundant native and exotic edible and medicinal plants on this remarkable planet. 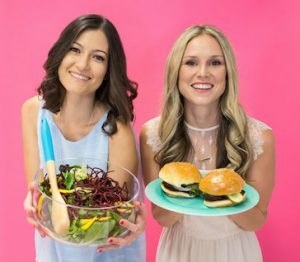 She inspires personal welfare through an ecological lens that connects individual actions with the greater issue of sustainability. She can be reached at [email protected], or on her facebook page here.